Hi friend! I hope your weekend was spectacularly amazing! I’m still taking part in Meghan Telpner’s Amazing Life Detox, so it’s been a pretty interesting week digging into all my attachments, my finances, my work, my relationships, my diet, my thoughts, and my space. I did some decluttering on Saturday that has made my working and writing space much more conducive to productivity. I’ve also been juicing like a mad fiend, creating recipes and generally nourishing my body after the holidays. Another great way to help rebalance your body post holidays is to make sure you’re incorporating some fermented foods into your daily diet. Thus today’s recipe forms an important part of any well-rounded eating plan. Fermented foods are a great way to add probiotics to your diet without having to spend a ton of money on supplements. These friendly gut bacteria are necessary for proper digestive function and a strong, healthy immune system. 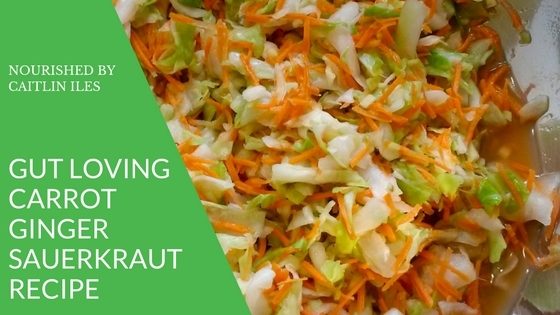 The carrots in this sauerkraut also provide a healthy source of beta-carotene, which is a phytonutrient that functions as an antioxidant in the body and can be converted into vitamin A to help beautify and nourish our skin. And let’s not forget the zingy ginger you’ll be adding as well! It’s great for helping improve digestive function and ease gas, bloating, and nausea. This spice is one of my favourites and I eat some every single day in one form or another because it adds such a great flavour to so many different dishes. To buy homemade kraut at the market or health food store can range anywhere from $5-$10 for less than a litre! To that I say PSHAW! I made this batch of kraut for under $1 because I bought the biggest head of cabbage I’ve ever seen at Saskatoon’s Folk Fest this summer for only $3. It made over 4L of delicious kraut. Check out how easy it is below! Finely shred or chop cabbage, retaining one leaf from the outside. Add to a large metal mixing bowl. Lightly toss to coat cabbage, giving the occasional squeeze. Let sit 15 to 20 minutes or until water leaches out of cabbage. Firmly massage cabbage for 3 minutes, squeezing out water until you have a good amount of liquid in the bowl. Add carrots and ginger and continue to massage until softened, about 1 minute. Pour into a 1 litre mason jar and use the leaf you saved to push the kraut below the brine so that it stays submerged. Make sure there is enough liquid to cover the kraut fully. You may have to add a little bit of water. Place a piece of parchment paper between the jar and lid. Seal and let ferment for 3-28 days. Well that’s the gut-loving recipe for today, friend.